2/7th Bn, The Royal Warwickshire Regiment, 182nd Brigade, 61st Division, T.F., B.E.F. Captain Llewellyn Albert Edwards, Royal Warwickshire Regiment, previously reported wounded and missing, now reported killed in action on March 22nd at 11pm, was 25 years of age, and the elder son of the Rev J J Edwards and Mrs Edwards of Berrow Vicarage (the Rev J J Edwards was formally Curate-in-Charge of St Andrews, Malvern Common). 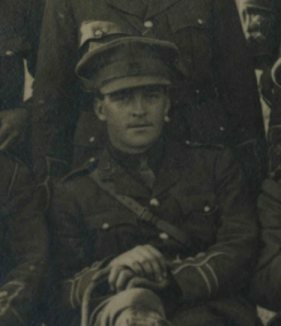 The deceased officer obtained a scholarship at Malvern College from Dr Douglas’ school, Malvern Link, and gained an open scholarship at Christ’s College, Cambridge, where he had been in residents one year when the war broke out. He was a member of the Malvern College and Cambridge O.T.C. In October 1914, he was commissioned into the 7th Battalion of the Royal Warwickshire Regiment was gazetted Lieutenant the following December, and Captain in March 1916. He was severely wounded on July 19th, 1916 while leading his Company of the 2/7th Royal Warwicks. He returned to the front in April 1917, and was given command of his old Company. Capt Edwards was recommended for honours for the manner in which he conducted his men in the retreat on March 21st and 22nd.